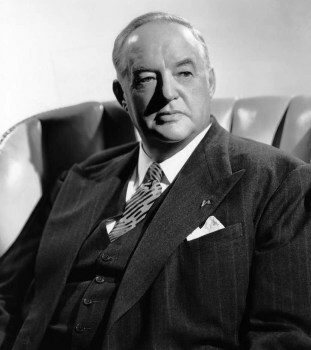 Sydney Greenstreet was one of Hollywood's most brilliant character actors, able to play rogues whose villainy in movies like 'Casablanca' and 'The Maltese Falcon' remain among the cleverest and most memorable depictions of innate menace ever captured on film. Although he appeared in only 23 movies over an eight year film career, after a long stage career in England, he is one of the best remembered and most recognizable of all film actors. Greenstreet was born Sydney Hughes Greenstreet on December 27, 1879, in Sandwich, England, one of eight children. Aged 18 and full of ambition, he left home and travelled to Ceylon (now Sri Lanka) to become a tea planter but a drought foiled his plans for a business career, and forced him to return to England where he a held down a variety of jobs including managing a brewery, while studying acting in the evening under Shakespearean actor, Ben Greet. He made his stage debut playing a murderer in a 1902 production of 'Sherlock Holmes' and then gained invaluable experience touring Britain for two years with Greet's Shakespearean company. In 1905 he travelled with them to the United States and made his Broadway debut that year. For the next thirty years he built up a formidable reputation as a strong and versatile stage actor, moving easily between musical comedy and Shakespeare. He travelled often between England and America, working through most of the 1930s with Alfred Lunt and Lynn Fontanne at New York's Theatre Guild. Greenstreet married Dorothy Marie Ogden in 1918 and they had one son, John Ogden Greenstreet. Greenstreet was a traditional stage actor. He received many offers to make the transition to movies but for thirty years consistently refused them. Then in 1940 whilst in Los Angeles appearing in a touring production of 'There Shall Be No Night' he met John Huston who discussed with him his forthcoming film adaptation of Dashiell Hammett's 'The Maltese Falcon'. The upshot was that in 1941, at the age of sixty two, he made his screen debut in the movie, achieving instant screen immortality as Kasper Gutman, 'The Fat Man', the first of many ruthless rogues he was to play over the rest of his career. Warner Brothers immediately signed Greenstreet to a long term contract and kept him busy for the rest of the decade. Despite only eight years appearing on the big screen, he managed to cram in a number of memorable parts that saw him holding his own with Hollywood legends such as Humphrey Bogart, Joan Crawford, Ava Gardner, James Stewart, and Spencer Tracy. Greenstreet's speciality was shady, malevolent characters, such as Ferrari, the proprietor of the Blue Parrot in 'Casablanca' in 1942 and Count Alessandro Fosco in The Woman in White' in 1948. But his skill and versatility enabled him also to slap on side-whiskers and play historical roles, such as Lieutenant General Winfield Scott in 'They Died with Their Boots On' in 1941 and William Makepeace Thackeray in 'Devotion' in 1946. He could also bluster as a bullying authority figure in comedy, as in 'Christmas in Connecticut' in 1945, or melodrama as in 'Flamingo Road', in 1949. In 'The Hucksters' in 1947, an expose of the advertising business, he spits at a business meeting to demonstrate that crassness can be memorable. He will always be remembered in connection with Humphrey Bogart and Peter Lorre with whom he appeared in numerous movies such as 1942's 'Across the Pacific' and 'Passage to Marseilles' in 1944 as well as the classic 'Casablanca'. After too short a time, in 1949, Greenstreet's eight year film career ended with 'Malaya', with Spencer Tracy and James Stewart. Having retired from the movies in 1949 due to ill health, Greenstreet worked on radio, adeptly playing the fictional private detective Nero Wolfe. He died on 18 January, 1954 due to complications from diabetes and nephritis. He was 75.